There are three ways of controlling reflux within a column still. These include Vapor Management Design (VM) , Liquid Management Design (LM) or Cooling Management Design (CM). You will conmanly see these as VM, LM, and CM which are abbreviations used to describe the type of management system used within the still. I’ve explained each system below and included an illustration to help you understand the difference between VM, LM and CM designs. that use this design is the Bokakob shown below. In the Bokakob design the vapor travels through the column past the copper plates (A) and hits the condenser (B). The distilled product falls onto the plates (A) at which point it either exits the reflux still via the needle valve (D) or drips back down over the packing in the column. By Adjusting the valve you can control the amount of reflux in the column. Hence why it is called a liquid management reflux still. 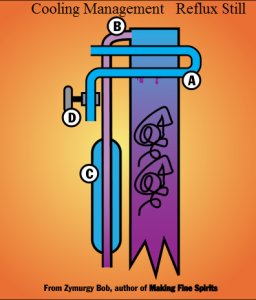 A reflux still using vapor management uses a large gate valve (C) to control the vapor going to the reflux condenser (B) and the final product condenser (E) . The VP design allows for very fine adjustments of reflux within the still. 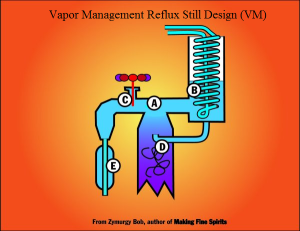 An example of a Reflux still designed using the VM system is shown in the picture below. Still using cooling management design has a reflux condenser (A) before the take off port (B). This condenser is usually in the column of the still and reflux is controlled by a water valve (D) hence the “cooling management design”. (see illustration below) This type of design is difficult to fine tune reflux within the column . 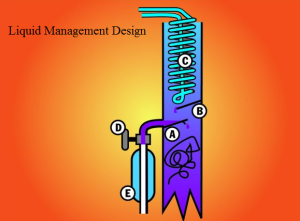 An example of this design is this CM reflux still plan. If you’ve got any questions about the difference between the CM, VM and LM designs or are still confused drop me a line and I’ll do my best to help you. 11 Responses to "The Difference Between VM, CM and LM Reflux Stills – Managing Reflux Within A Still"
Thanks for your excellent diagramms and the differentiation between the differences in reflux control of condensers. I built my own column but I have failed to get more than 88%abv and my spirit is not clean. It smells of dirty sulphur and some strange esters which are not nice something like burnt. I put my reflux condenser inside the colum but the draw off is above the reflux condenser. Please advise if I should change my reflux position and how I can get better quality alcohol. Just found your site after many nights of constantly searching for useful concise information, and not finding it, or being totally bamboozled by over detailed plans and descriptions that make cracking the Enigma Code look easy. Your site is perfect, clear concise, and easy to follow. I wish I had found this site earlier. Luckily I am still in the planning stage of my still, which will be so much easier now I’ve found this. A very BIG thank you from Liverpool,UK. Awesome glad you found the plans useful. If you have any questions while your building just shoot us a message. Feel free to share any other plans you’ve found online that you think people would find helpful. I’ve never made moonshine but im very interested in learning about it. On a reflux still how fast should you run the water through your condenser and, would a copper mesh instead of stainless scrubbers work as well? Yes copper mesh would work but make sure it’s pure copper and not copper coated with steel. Water rates will vary depending on the still and how much heat your pumping into the boiler. I like to feel the condenser and as long as it’s cool to the touch your good to go. If you want to learn more check out http://homedistiller.org/forum/ it’s a great forum. I’d recommend you also grab Making Pure Corn Whiskey: A Professional Guide For Amateur And Micro Distillers by Ian Smiley It’s a great book got me started years ago. I have a question regarding a distiller to make homemade brandy. I am not interested to make a 97% alcohol without any scents, on the contrary I want all the aroma to transfer to the destilate. Is my understanding correct that reflux distillers are generally very effective and produce destilates rich in alcohol? What about aromas? Is there a reflux distiller good in making homemade brandy? I have read that a pot still is good in making brandy, but since this is generally quite basic design it misses temperature control, not quite sure if it is effective. Can you help choosing the right distiller? You can use a reflux still to make brandy if you are going to go this route it’s important to remove the packing material inside the column of the still in order to lower reflux and thus preserve some flavour in your final product. I’d say you will get much better results if you’re able to purchase or build a pot still. I wrote this article a while back on How to make brandy might be of some use to you ! Sounds like your fermentation has stalled out. You can do one of two things add more yeast to get it going again in this case make sure you keep temps within the range listed on the back of the Turbo 48 pack. Two cold or to hot and you’ve got problems !! I often use EC – 1118 to restart fermentation it’s a wine yeast and seems to work good and can be purchased at your local home brew shop. The clearing agent that comes with Turbo 48 is meant to clear the wash so that you can drink it “as is” without distilling. Because your distilling it you can skip this step.